Our philosophy is simple, The Schulman Law Group is distinguished by our unique code of skillful, caring legal representation, hard work ethics and exhaustive preparation, … providing for extraordinary results for our clients! The meaningful results we have forged and the profound relationships we have formed and remain with our clients, are truly immeasurable. The Schulman Law Group – and its founder, Attorney Marvin S. Schulman, Esq., humbly enjoy the professional distinction of having served thousands of righteous victims and have won numerous multi-million dollar cases and settlements that not only compensated our clients for the losses they suffered, but also brought meaningful remedies to many profound risks that have threatened our society, thereby protecting the good of the public. Representing Victims for more than 38 Years! The Schulman Law Group, has recovered over Fifty Million ($50,000,000.00) Dollars, successfully representing the rights of victims of serious and catastrophic personal injury cases, trucking accident cases, motorcycle cases, train accident cases, airplane accident cases, products liability cases, premises litigation, maritime litigation, medical, dental and legal malpractice cases, as well as many other complex litigation cases. 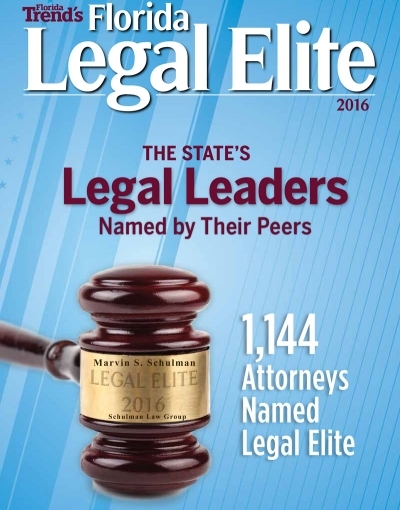 In practice 36 plus years, Attorney Marvin Simon Schulman, Esq., has been acknowledged as having earned and received the highest rating (AV) conferred by Martindale Hubbell. This is the most respected directory of lawyers and law firms in the United States, reflecting the confidential opinions of his peer attorneys and Judges, as a leading Florida litigation attorney. Marvin truly cares about his clients and seeks to do his very best for each of them. Even years after my accident, I value Marvin’s counsel and wisdom and will be forever grateful for his help during a very dark time in my life. We never felt we were clients, we were like family. In just 2 1/2 half years both cases were settled within days of each other. The cases were settled to our advantage and more than we had hoped for … and would not hesitate to use him again if ever need be. Also, he would be the only attorney we would recommend to friends and family. He thoroughly explained the whole process from start to finish and told me what to expect. Marvin met and exceeded my expectations. The outcome of our case resulted better than expected, which was directly related to his outstanding negotiating ability as a top notch attorney.